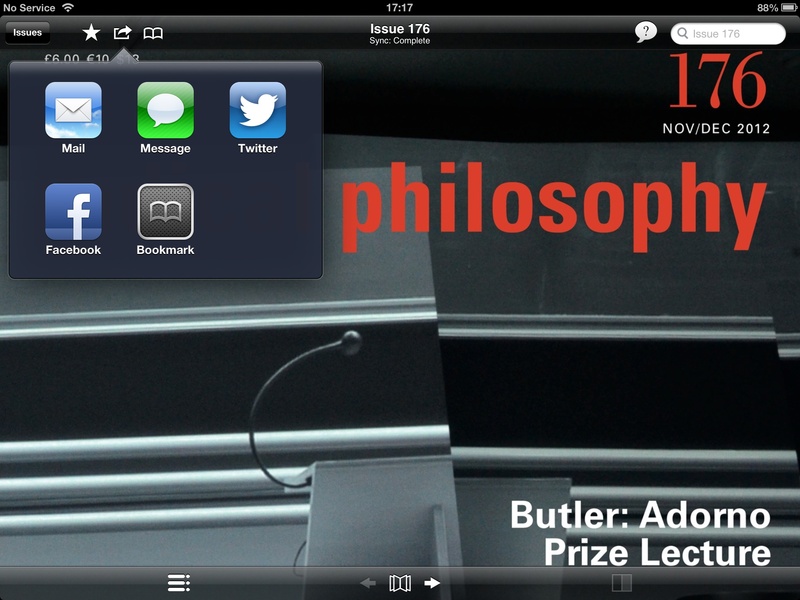 Exact Editions new apps (v 6.6) are now rolling through the works: Radical Philosophy and Blues Matters are two of the first through the gates. On the iPad they have a strong new bookmarking function. The user can bookmark interesting pages. 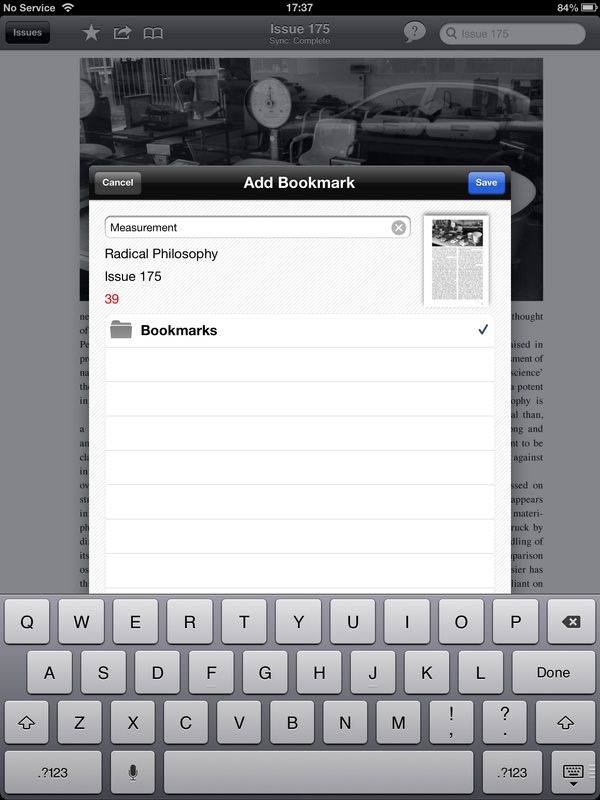 Also searches can be bookmarked and sharing actions will be bookmarked in a ‘Shared’ folder. These are powerful tools and we think they will be greatly enjoyed by the magazines’ subscribers. The Exact Editions apps now also have enhanced social features, so users can share page links via Twitter, Facebook, and via email etc….. When a page is Tweeted or emailed the tweet/email will give the recipient a direct link to the page cited and a thumbnail image of the full page. Subscribers can click through to the full content. Non-subscribers who click through will see a thumbnail and be encouraged to buy a subscription. Delivering digital magazines as searchable, with deep archives, with pages that can be bookmarked and shared is a way of giving magazines on the iPad more heft more stickability and of course a way of unfurling more value for the subscriber. A subscriber who has browsed her archive, searched through years of back issues, bookmarked important articles and shared cool views with her friends, is a subscriber who is going to renew her subscription. We think magazines that have a rich content stream absolutely need strong searching and bookmarking capabilities. 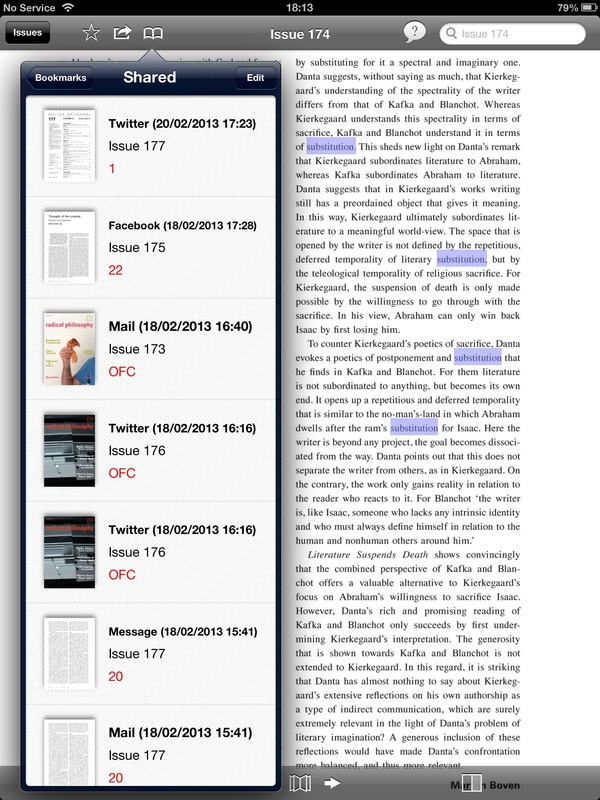 Individual pages can be bookmarked and the user has the opportunity to give them a title and organise them in folders within the app. Saved bookmarks can be organised into folders and subfolders, and their order rearranged. Touching a red No Entry sign allows one to delete a bookmark. Dragging with the grey handles on the right of the pane allows us to slide the bookmark up or down the list. Perhaps the most powerful aspect of the new bookmarking function is that we can now save Searches and Bookmark them, at the same time saving and syncing all the pages caught by the search. 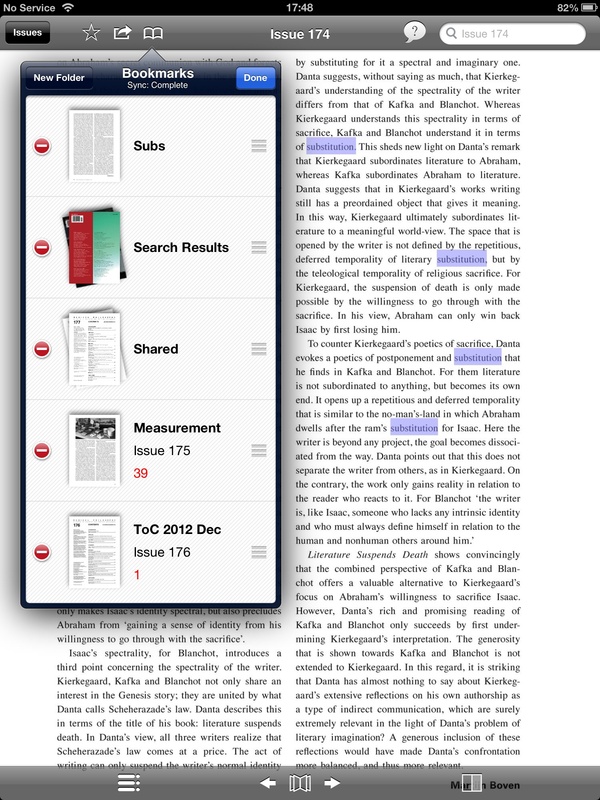 With an extensive archive it is impractical to sync every issue to the iPad, but extensive searches can be saved with the relevant pages syncing to the device for later analysis; or interesting searches can be saved as a simple record that one may need to go back to. Social activity: sharing via Facebook, Twitter, email, sms etc is now saved by default into a separate folder. These records can also be organised into folders and subfolders, or cleaned up, deleted or rearranged as desired. 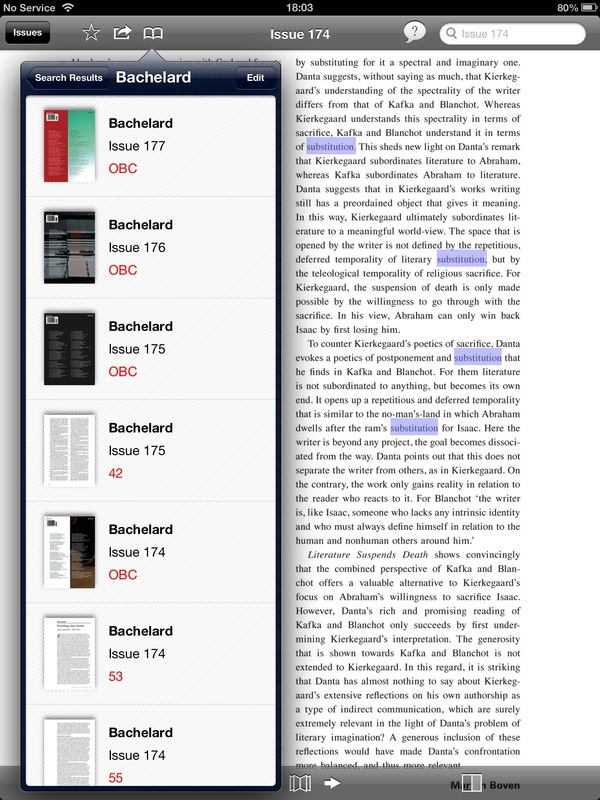 The general principle is that these in-app bookmarks will work in a similar way to Safari on the iPad.